Exercise for winged scapula on the arc barrel. I have a winged scapula that is not upwardly or downwardly rotated. Any ideas on what Pilates exercises I could perform to help this? I am in no pain. I have looked at the muscles in that area, Trapezius Lower, Rhomboids and Serratus Anterior and presume these will need working? Hi Liz and thank you for your question. I had this same problem when I first started my Pilates training. Both my shoulder blade's were winging out everywhere. I really had no control of the muscles that stabilized the scapula. Specifically, once I started using the spring tension doing the long stretches on the reformer they really wanted to pop out. The winging especially happens when you pop your ribs or lose your abdominal control to help stabilize the core including the ribcage and scapula. 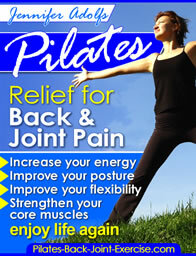 In Pilates the core involves stabilizing everything from the scapula to the glute folds at the base of the pelvis. Imagine your ribcage being stretched apart as you inhale and then knitted together as you exhale. Keep that knitted feeling now as you are exercising breathing in and out. 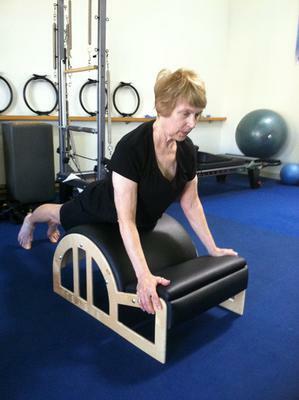 This should not only stabilize the front of the body, but the upper back and scapula as well. Probably the best exercise to help strengthen and stabilize your postural muscles including those that help with the winging scapula and the Serratus Anterior is the Cobra or Elbow Press as shown in the image above by Karen. Lying prone or on your stomach, inhale and press into your elbows and forearms to lift your head, chest, and ribs up off the floor feeling your shoulder blades move towards the spine without pinching, then exhale and push your elbows and forearms away as you round or flex your upper back moving your shoulder blades wide apart on your back. Best Exercises for Shoulder Stabilization. Scapular Retraction and protraction exercises are especially helpful to bring awareness to the shoulder girdle complex. You can practice this kneeling with your hands right under your shoulders or chest pressing into your hands to separate your shoulder blades and then opening your chest and moving them towards the spine in back. You can also try this standing at a wall or with your arms straight out from your chest drawing the shoulder blades towards the spine and then wide apart. And, find more shoulder exercises in my newly revised Shoulder Ebook here. The "knitting" cues are easy to follow.